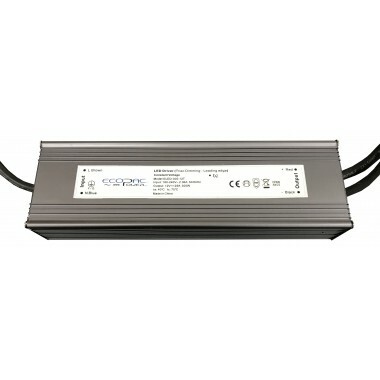 In addition to the ELED range of 25W, 50W, 100W, 150W and 200W mains dimmable LED drivers, Ecopac Power has developed a 300W version with 12V and 24V outputs. The ELED-300-T is designed to work with a full dimming range of 5W up to 300W, allowing users to fit any length of LED strip from 5W up to 300W and still maintain very smooth dimming. Manufactured with an input voltage of 180 – 240VAC with power factor correction and high efficiency up to 90 per cent, the ELED-300-T also meets EN61000-3-2 for the lighting industry and complies with EN61347-1 and EN61347-2-13. Developed with built-in short circuit and over temperature protections and a working temperature range of -40℃ to +60℃, the ELED-300-T comes with a three year warranty.